Issue #56 • November 7, 2018•Buy Now! ​I jumped at the sound of my name, dropping the double bridle I was cleaning. It fell to the neatly-swept floor with a clatter of metal bits and buckles, and I winced at the noise. My nerves were shot; every unexpected sound set my heart racing. I turned around on the overturned crate I was using as a bench and saw Franz peering through the door. He and I were élèves, riders in training, at the Spanish Riding School of Vienna. ​I offered a weak smile in return and bent over to retrieve my bridle from the floor, trying to still the obvious trembling in my hands. “I think I have a right to be nervous, Franz,” I said. “These bombings are putting us all on edge.” Images of late-night air raids flashed through my mind—how I’d struggled to remain calm while I helped lead the group of invaluable Lipizzaner stallions from the stables and into the sheltered hallway that led to the Winter Riding School, sirens screaming our impending doom and Allied bombs crashing all around us. The air raids had been going on for almost a year. Erin Snyder is a sophomore and aspiring author at Sweet Briar College, where she studies Biology and Creative Writing. Erin has been riding horses since the age of five and enjoys the discipline of dressage. On a trip to Vienna, she had the opportunity to watch a performance of the elegant white dancing stallions at the Royal Spanish Riding School. That experience fueled her love for the Lipizzaner breed and inspired her to write “Escape from Vienna.” When not studying, riding, or writing, she enjoys performing in musical theatre productions, competing on the equestrian team, or serving as a teaching assistant for the SBC Riding Program. ES: I’ve loved the Spanish Riding School of Vienna ever since I attended a performance there about ten years ago. I saw the Disney film Miracle of the White Stallions shortly after that. The story of the stallions’ harrowing escape stuck with me and spurred me to do a little research on this period of their history for a 4-H presentation. Then, a few years ago, I read Elizabeth Lett’s The Perfect Horse, which details the stories of horses stolen by the Nazis (Austrian and Polish Lipizzaners, Polish Arabians, and Russian Kabardins) to create the “perfect horse” during World War II. 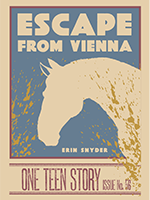 The Lipizzaners’s thrilling escape from Vienna caught my attention again, and thus my story was born. PR: How did you prepare yourself for writing a story set in 1945? What sources were the most helpful? ES: The Perfect Horse was invaluable! I also used Google maps a lot for geography questions, and various history sites for questions about how the war unfolded. PR: One of the things I most admire in your story is the tension. It drives the plot to great effect. Was that something that came easily to you, or did you labor over it? ES: The tension and pacing of the plot actually came pretty easily to me. I tried to take a step back and put myself in Tobias’s shoes every time I sat down to work on the story. How would I feel if it were my horses trapped in Vienna during an air raid? PR: Tobias and Franz have far more drama to contend with than most teens. Where do you see them, say, twenty years after the end of the war? Are they still friends? Are they still working in the equestrian world? ES: I think Tobias and Franz are just at the beginning of a lifelong friendship. Tobias especially has found a home at the Spanish Riding School, so I imagine that both he and Franz would still be at the School, working their way up through the ranks. ES: Bravery. How much are you willing to risk to save the ones you love (human and otherwise)? ES: Most of what I’m working on right now is short stories for my creative writing class. I have ideas for more historical fiction stories, and a dystopian piece centered around climate change that is way different from anything I’ve ever done. I’m very excited about the last one—I can’t wait for winter break so I can start working on it! ES: Don’t ruin the “magic.” Don’t feel like you have to give too much away; readers are often more perceptive than writers expect them to be.